I used to think that eye creams were a gimmick by the beauty industry to convince the consumers that it was a necessary buy. The only issue I ever had with my eye area is puffiness. Then I started noticing some fine lines at the corner of my eyes. Between squinting (near sighted) and laughing, I knew I would eventually get lines in that area but I didn’t think in my 20’s. After reading Chizu Saeki’s book The Japanese Skincare Revolution, I was ultimately swayed into giving eye creams another chance. With that decision I told myself that I wasn’t getting anything expensive. I would have hated myself if I spent all that money and didn’t receive the results I expected, if any at all. 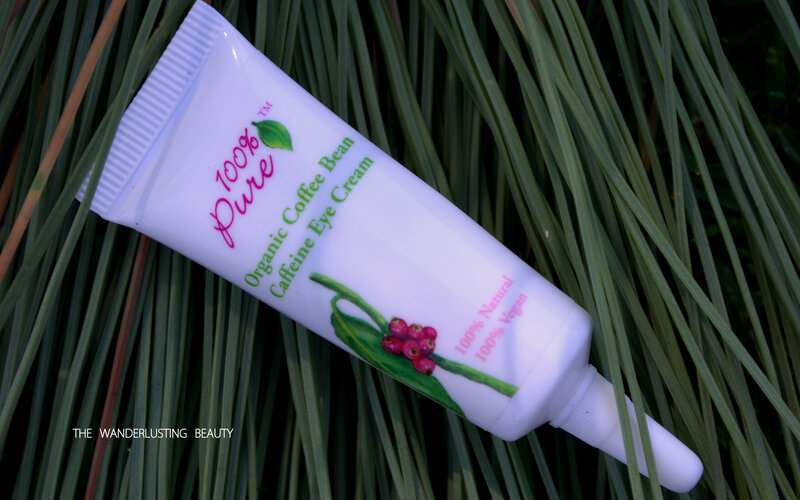 As I was purchasing other products from 100% Pure’s website, I saw that they had an eye cream with some promising results. Sounds too good to pass up, right? For $19 you get one full ounce. Extremely affordable compared to the high-end brands. Even better, they had a smaller size for an even cheaper price. So I opted for the smaller tube as a trial size. As you can see, the packaging is in a small plastic, squeezable tube. Before ever using it, you must cut off the sealed tip. I’m not particularly a fan of that type of packaging because I’m always afraid that I’ll snip off too much or too little. The consistency is a little thick but not heavy. As the title suggests, there is definitely a coffee smell to this. However, it’s not a strong smell and dissipates quickly after application. If there’s anything I can vouch for 100% Pure it’s that they always smell like whatever it says. Every morning and night I apply about a pea size amount to both eyes. Using my ring finger as the applicator, I gently pat the cream all over my eye area. In the beginning I didn’t see much of a difference. I wasn’t expecting miracles but I was really hoping to reduce my under eye puffiness. I have slight discoloration under my eyes and I didn’t see much difference in that as well. However, it was doing a great job of moisturizing. Like I said before, it’s not a very heavy cream and that allows my skin to absorb it easily and quickly. The ingredients list is quite short and very easy to read. Now, 3 months down the road, I can attest to better results. My under eye puffiness is still there and that’s OK. I honestly don’t think any cream will be able to fix that. My eye area is always moisturized and the fine lines have nearly disappeared. It also looks much smoother and feels softer. Overall, I do like this cream. For the price and results it’s totally worth a try even if you purchase the full ounce size. It hasn’t impressed me enough to list this as a holy grail item but I would definitely repurchase this. I also like the fact that it can last you a while. This product needs to be used within 6 months of opening. Stretch $10 for 6 months?! No problem! Have you used this or any of the other 100% Pure eye creams? What are your thoughts on eye creams in general? Sounds like a lovely eye cream indeed. Many people are loving this one.. simple ingredient list, very affordable too (although it’s over 30$ here in aussie!). I want to try this though! I was also like you, I felt like I didn’t need eye creams and only used my facial oils to hydrate them. However, until my dark circles and puffiness got worse (long nights..) I actually initiated on buying one. I’ve found a nice one that works.. but I would like to venture other options. The longer I examine my eye area the more I’m noticing a difference. The only discoloration I’m seeing is at my inner corner eye. The rest of my eye area is really smooth looking and hydrated. What eye cream are you using now? I’ll be going to Australia in 3 weeks! Can you recommend clean Aussie brands? Wonderful Jade! I’m about done with my little tube and will be testing out other eye creams/gels. However I will keep this in the back of my mind as one that I can always go back to. The price is unbeatable!